Mormyrids might be Pokémon: Can we see ‘evolution’ within a single individual? Savvas Constantinou preparing to inject single cell Brienomyrus brachyistius embryos. 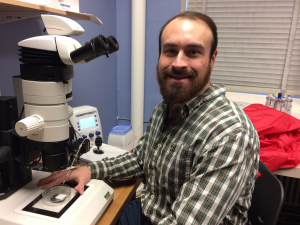 I’m Savvas Constantinou and I am a second year PhD student studying Integrative Biology (IBIO) & Ecology, Evolutionary Biology, and Behavior (EEBB) in the Natural Science department at Michigan State University. I came to grad school to study Evolutionary Developmental biology; specifically what interests me is understanding how gene regulatory networks are modified over evolutionary time to generate new species and novel structures. I am probing this question using Mormyrids, a species-rich group of weakly electric fish. Mormyrids generate low levels of electricity (less than 1 volt) from their electric organ, and then sense this electric field on their skin with specialized cells; by monitoring distortions of their electric field these fish can locate and discriminate objects in their environment and communicate with their own species and discriminate other species. Development of the larval and adult electric organs and the accompanying electric organ discharges in Brienomyrus brachyistius. A. Top to bottom. The larval electric organ differentiates from skeletal muscle in the body but is restricted from a region of the tail called the caudal peduncle. As the fish metamorphoses into an adult, the adult electric organ develops and discharges simultaneously with the larval electric organ. Eventually the larval electric organ is lost and the adult electric organ fully matures and develops penetrations. B. 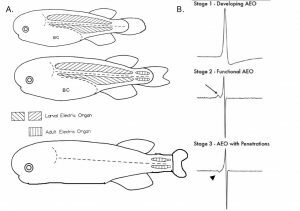 Top to bottom: The electric organ discharges from a larval fish (note the simplicity), from a fish discharging from both a nearly degenerated larval electric organ (arrow, note small relative amplitude) and a non-mature adult electric organ, and from an adult, fully mature fish (arrowhead note small head negative peak). Figure modified from Denzoit et al. 1978. The larval electric organ of the weakly electric fish Pollimyrus (Marcusenius) isidori (Mormyridae, Teleostei). Journal of Neurocytology 7: 165-81. The electric organ actually develops twice within the lifetime of a single individual. In the species I work with, Brienomyrus brachyistius, they develop a larval electric organ about a week after hatching. The electric signature of the larval electric discharge is very simple. During metamorphosis from fry into an adult, the fish begin to develop their adult electric organ in a different location from the larval electric organ. The electric signature from the adult organ is more specialized and complex than the larval organ and begins discharging while the larval organ is still active. Eventually the larval organ is completely lost and the adult organ becomes more complex through a specific change in anatomy (see figure for clarity). What excited me so much about this system was the idea of being able to “see evolution” within the lifetime of an individual. The function of the larval electric organ has yet to be experimentally determined: it is a costly structure as they discharge upwards of 100X a minute and it is like a homing beacon for electroreceptive predators. The adult organ is responsible for the more complex signals; variation in these signals have thought to been a driving force in speciation of mormyrids. So why do mormyrids waste the energy to even build the larval electric organ? I believe it has to do with evolutionary constraints. The most basal member of the Mormyroidea is Gymnarchus niloticus, a weakly electric fish that has an electric organ similar to the Mormyrid larval electric organ in location and discharge complexity. I think that the ancestor to these groups had an electric organ that was like the larval electric organ of Mormyrids. The Gymnarchus lineage survived with some changes to the electric organ whereas the ancestral Mormyrid developed this second, more specialized electric organ that allowed for their rapid species diversification. I want to investigate what gene regulatory networks are at play to induce development of the adult electric organ. Is this different from the genes involved in differentiation of the larval electric organ? By probing these questions, I hope to test the idea that mormyrids have a strict developmental trajectory that requires formation of the larval electric organ before the adult electric organ can develop. To further understand evolution and speciation in this group, I also plan to investigate the genes involved in the anatomical change that occurs during the final maturation of the adult electric organ. Through this final maturation the adult electric discharge becomes more complex, a feature implicated as a force driving sexual selection. After Mormyrids evolved the anatomical change to increase signal complexity, multiple species and groups have lost the ability, again suggesting its importance in speciation. To me, understanding what genes drive this process and how they are tweaked in their timing and spatial distribution of their expression to give rise to the amazing signal diversity of Mormyrids is fascinating. I have been spending most of my time in my PhD developing the “toolbox” of techniques that will help me to answer the questions I am interested in. I have been optimizing laboratory breeding and fry rearing in B. brachyistius to allow me to study these developmental questions. I am a molecular biologist at heart, and have begun to test gene function using the gene modification technique CRISPR. CRISPR is a way in which nearly any region of the genome can be targeted for change: either to modify the DNA and disturb gene function or to direct addition of other genes (like Green Fluorescent Protein). I intend to use RNA-sequencing of larval and adult electric organs at various time points to determine what genes may be responsible for their development. My grand plan is to be able to silence genes involved in larval electric organ development, and then to see if an adult electric organ can still be produced when the larval organ has not. Eventually I want to compare the gene circuitry regulating the development of electric organs among many species of Mormyrids as well as to those of Gymnarchus. By comparing changes in expression levels, timing, and location, I hope to bring insight into a potential genetic mechanism involved in allowing Mormyrids to speciate so successfully and rapidly. Stay tuned for future “shocking” information on Mormyrid electric organ development!